Caring for young children’s teeth is an important part of keeping their little bodies healthy and it’s never too early to get started. Strong baby or first teeth set the stage for strong, healthy permanent teeth and help kids learn, play and grow. A child’s first visit to the dentist sets the stage for lifelong oral health. Our goal at Chace Lake Family Dentistry is to make happy and healthy smiles a reality for our young patients. We do this in a fun and relaxed environment that puts you and your child at ease. We hope our tools, tips and fun links to videos and games help you, and your child, care for their teeth together. Our No Cavity Kids Club is to create excitement and encouragement for kids to brush and floss their teeth so that they have no cavities at their dental appointment. When a child has no cavities at their appointment, they will receive a No Cavities Certificate of Achievement to take home with them. If you are agreeable, we will ask you to sign a Release and we will take their photograph with their Certificate to use in our marketing and post it to our social media pages to share their great news. 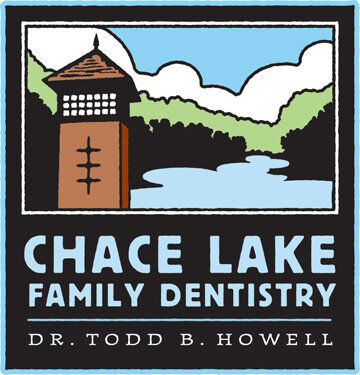 We also encourage you to take photographs to post and tag Chace Lake Family Dentistry. Each kid with no cavities will receive a reward of appreciation from Chace Lake Family Dentistry for their hard work. It’s very important to maintain the health of the primary (baby) teeth. Primary teeth affect the development of speech and add to an attractive appearance. While the front 4 teeth last until age 6-7, the back teeth (cuspids and molars) aren’t replaced until age 10-13. Neglected cavities can, and frequently do, lead to problems which affect the development of permanent teeth. Primary teeth are important for proper chewing and eating, providing space for permanent teeth and guiding them into the correct position, and permitting normal development of the jaw bones and muscles. Did you know the average child smiles 400 times a day? With all that smiling, your little one should be happy to show off their pearly whites! Educating kids about the importance of dental health is vital for a lifetime of healthy teeth and gums. Help your child early to enjoy a dental routine of brushing and flossing. Encourage your kiddos to practice good dental health and show off their smiles! Help your preschooler brush their teeth at least 2x a day (after breakfast and before bedtime). Young children should brush their teeth for about 2 minutes (parents can play music or sing the ABC song four times to help them keep track of time). Look for kid’s toothbrushes with small heads with soft, or extra-soft, bristles. Let your child choose their toothbrush color to get excited about brushing. A little toothpaste goes a long way! Children ages 2-5 should add a pea-size amount to their toothbrushes. For children under 2, just a smear does it. Be sure to use a non-fluoride toothpaste. Help children reach tricky back teeth while protecting tender gums. Visit your dental office twice a year. Teeth love crunchy fruits and vegetables! Try tooth-friendly foods like apples, pears, celery or carrots. Drinking water help keep little bodies strong and healthy. Water can also help wash away food from teeth if there’s no time to brush after a snack. Start flossing your children’s teeth even when they have only their primary teeth. You can help them learn to floss as they develop better dexterity. To stress the important, parents should floss for them regularly until they’re able to do it themselves. Use floss that doesn’t hurt their teeth and is comfortable on their gums. Kids have different oral health needs as they grow. We want to help your kids of every age have good dental health. The earlier children learn to take care of their teeth, the better. Kids, just like adults, should be brushing at least twice a day and flossing once a day – every day! 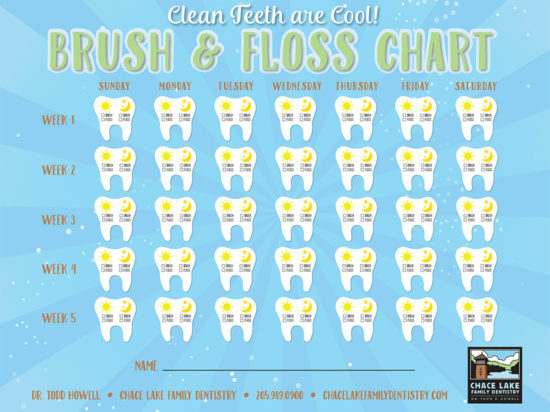 Make sure they’re doing their daily dental care with our brushing and flossing chart. Let your child fill-in each tooth each time a dental duty is completed.